Any way you look at it, Denver’s bus riders are treated as second-class citizens. While drivers cruise around on well-paved roads, quickly plowed in the winter, transit riders are lucky to have a sidewalk leading to their bus stop, let alone a sidewalk clear of snow and ice. People waiting at bus stops are lucky to have a bench to sit on or a shelter to shield them from rain and snow. How does RTD decide which bus stops get shelters and which don’t? “Shelters are prioritized at stops with the highest number of average daily boardings,” according to the report, and at least 40 passengers have to board each day for a stop to qualify. Decent bus stops are not just nice-to-have amenities. Transit riders view waiting conditions as a top tier concern, according to a recent survey by TransitCenter. They want to wait safely and with dignity, but too many Denverites who ride the bus find themselves sitting in the dirt next to traffic. This post is part of a series on fixing Denver’s transit system, based on the city’s newly-released “State of the System” report. Stay tuned for more in the coming days and weeks. “While drivers cruise around on well-paved roads, quickly plowed in the winter”… Ha! Yes Denver needs sidewalks and a better transit system, but there are a lot of potholes out there and I have yet to see a residential plow on any street I have lived on in Denver despite whatever DPW says. 12 inches or the now 6 inches a residential plow is a mythical beast and a Denver resident is more likely to see a Yeti. That said I would like bus shelters and sidewalks rather than relying on snowshoes and parkas to get around in the winter. “well-paved roads” sounds like an oxymoron in Denver. I know they had some ketchup funding in the Better Denver Bonds but that was 9 years ago. Then I think there was a one-time CIP transfer of additional money in 2013, some of which went to repair and repave the worst roads for three years. Currently, a lot of money is being spent on Brighten Blvd. but that’s just one small piece of Denver streets. Like any infrastructure asset if you don’t maintain it then it becomes even more expensive to correct. With respect to bus stops I’m all for more and better waiting areas. The streets are much too wide. They should be narrowed down, and a lot of them should simply be closed. Then the city could concentrate better on repairing the streets it needs. Good luck with that fantasy. Actually, your view is too simplistic. You could accomplish much the same result by creating a much better transit and bike system. That will take a few $billion since it needs to work not only for downtown but for the metro area. Some of this can be addressed by Denver but the rest will need metro funding. For now we can wait to see what Denveright/Denver Moves comes up with. I look forward to that. Actually narrowing the streets is the same as creating bike lanes. It just takes a bucket of paint and some metal posts to create a bike lanes. And bikes, unlike cars, don’t pothole streets, so the city automatically reduces its long term liabilities by eliminating waste in its street plan. America’s greatest weakness is it inability to find cheap, simple solutions to every day problems. That is why there are so many problems in the cities. Many of the RTD shelters in the DTC have been replaced within the last year with very attractive shelters that don’t really shelter you from anything. They’re better than nothing and provide a seat and a bit of shade if the sun’s directly above you, but aren’t much protection from rain or wind. Admittedly the old shelters were in need of an update as the panels on the sides were usually loose (and probably a hazard in high winds), but they were good enough at keeping the rain off that you could close your umbrella while you waited. Glendale has installed a few of its own bus shelters that look nice and work well as shelters, and I’d be happy to see more like them. While I’m wishing, overhead heaters at the train stations would be wonderful. Waiting on an exposed, windy platform in winter is a lot easier with a button-operated heat source. I love it. Why ask for just decent shelters? Heated or air-conditioned shelters would be the bomb. And maybe if we ask for more then we’ll get met half-way. I would also like to see public bathrooms at busy RTD light rail platforms and Bus stations as well. Public transportation should be better than private car ownership not just an afterthought. Agreed! Though air conditioning is a tougher one — it requires an enclosed space and uses more energy, more continuously, and the waste heat would make the rest of the station worse. A good option that wouldn’t require a complete station renovation would be large portable fans, preferably the kind with a water mist. Heaters are an easy retrofit, and don’t require much maintenance. The ones I’m familiar with on NJ Transit platforms are mounted on the ceiling of large semi-enclosed shelters. You press a button and there’s radiant heat instantly. It turns itself off after a few minutes so that it’s not heating empty space after you’ve boarded your train. I’d also welcome anything that would discourage smoking at stations and stops. I get that RTD doesn’t think they could enforce it, but there’s got to be some way to at least keep smokers away from the elevators. There’s no way to tell what you’ll be opening the elevator door to, so you can’t avoid the smoke. Misters would be an easier lift and since it works for riders in a 110 degree heat it should work well enough for Denver. Oh yeah–clean, safe, accessible public restrooms are the mark of a civilized society. Also, water fountains. While sidewalks and accessibility are fundamental needs, I’d honestly trade all the shelters in the world for a complete network of high frequency (<10 min headways) routes with off-board fare payment and all-door boarding. One can dream. 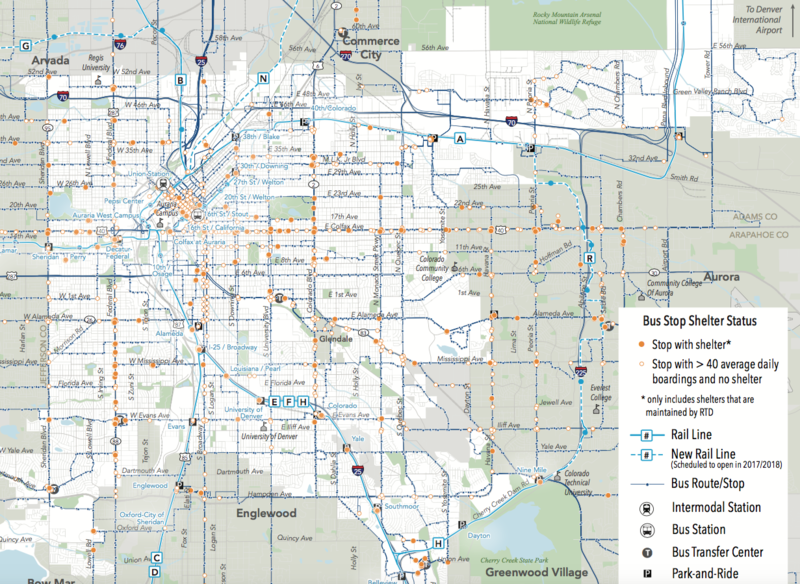 Typically that is being implemented with BRT and enhanced bus routes and I’m sure that Denver is looking at that with their Denver Moves project. In Germany there is a company called Wall that builds bus stops and other sidewalk furniture in exchange for the right to advertise there. Notice the W logo. The City and County of Denver and other municipalities in the RTD district do work with advertising companies to install shelters that the companies maintain and can post ads on. Unfortunately, it’s up to the ad company if they think that every stop location is also a good advertising location. Three big negatives about bus shelters. One, idiot vandals destroy them for “fun”. Two, RTD is in the transportation business, and would rather spend their limited resources on moving people, not building and maintaining shelters. Three, RTD does not own the land at most bus stops, it most likely belongs to city or the county. If you want more shelters, the people you need to be talking to are your local, elected, representatives – they build and maintain parks, ball fields and parking meters – there’s no reason (other than political will and other priorities) why they can’t build and maintain shelters and benches, as well! I think the lack of respect comes from an assumption particular to Colorado and other states that wouldn’t collapse if their public transit system did: Non-drivers are not citizens. From the use of Drivers Licenses as general ID, esp. voting ID, to the removal of driving privileges after incarceration, non-drivers are “less than”, in the region’s eyes. Coming from NYC, where there are several interlocking rider constituencies, it was a shock to see how few riders are listened to by the powers that be, even those riders from affluent areas. I think the reason for such disrepair and neglect is that bus passengers are considered to be second-class citizens — people who are not non-drivers by choice, but are driving non-citizens — those who lost the privilege of driving. It’s inscribed in our voter registration process, check writing — and because of that services are delivered by the insult, even in areas with high-enough demand and income that the improvements would pay for themselves through higher ridership.